Creamed Roasted Vegetable Soup is prepared with roasted broccoli, cauliflower, Brussels sprouts, and onion. 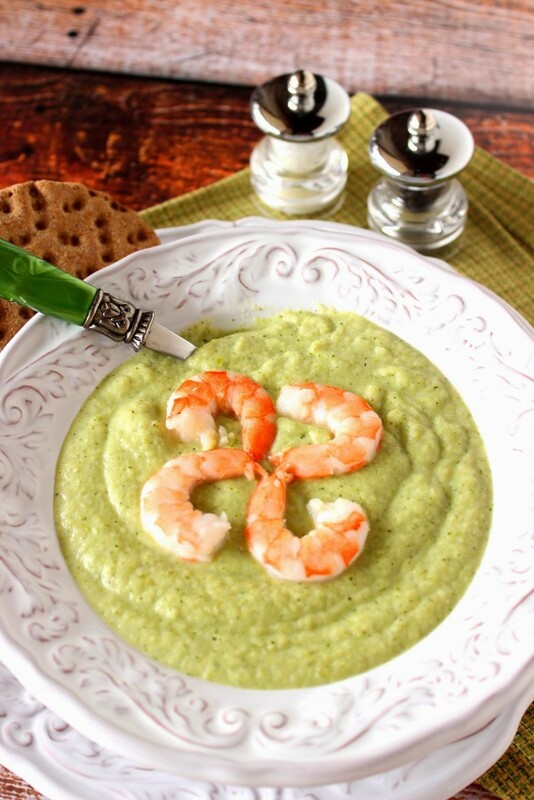 This creamed soup is completely hearty, low-calorie, healthy and utterly delicious! With roasted vegetables being all the rage, I thought a soup that combined the flavors of roasted broccoli, cauliflower, Brussels sprouts and onion would be especially delicious and perfect for anyone who is looking to cook and eat healthier (me included). Plus this recipe coordinates wonderfully well for this week’s edition of #SundaySupper and our timely theme of “A Lighter New Year. To bump up the protein level of this soup, I decided to add some cooked, shelled shrimp on top. 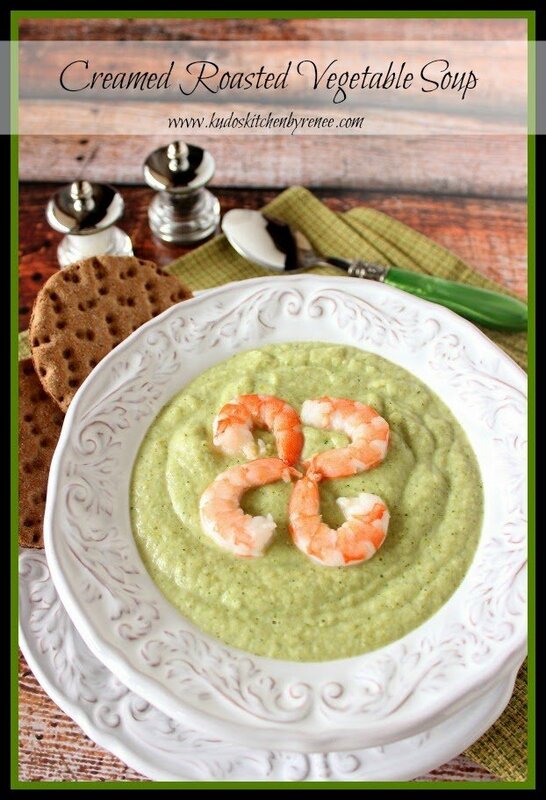 Because this soup is so thick and creamed the shrimp rest perfectly on top and make a very attractive presentation. Of course, the shrimp are completely optional if you’re not a fan. But if you are, you’ll enjoy the extra flavor and texture that the shrimp will provide. This soup works well as a dinner entree or as a quick lunch when heated in a microwave which makes it perfect to bring to work so you can stay on track with your eating program during a long, hectic week. Serve it along with a few whole grain crackers, and you have a completely satisfying meal that more than surpasses your daily requirement of veggies with all their important fiber. -Line 2 rimmed baking sheets with aluminum foil. 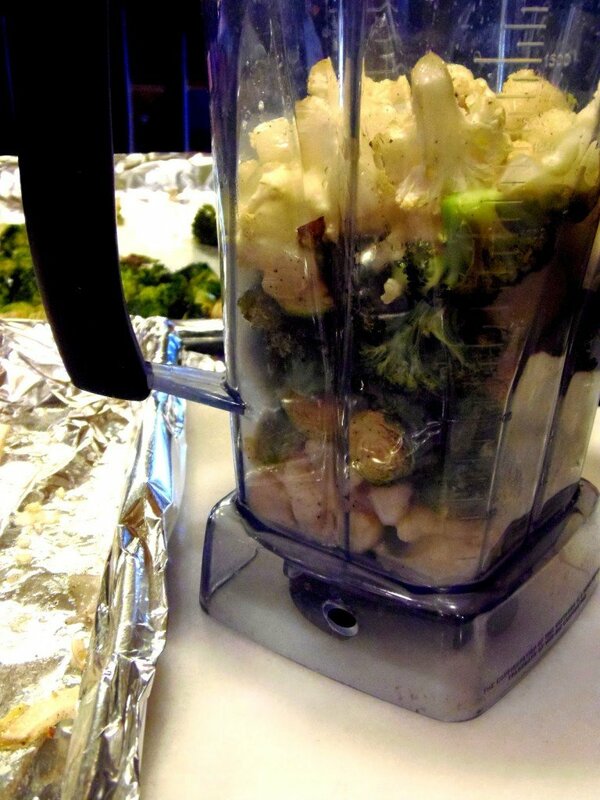 -Place the broccoli, Brussels sprouts, cauliflower and onions in a large bowl and toss with the canola oil. 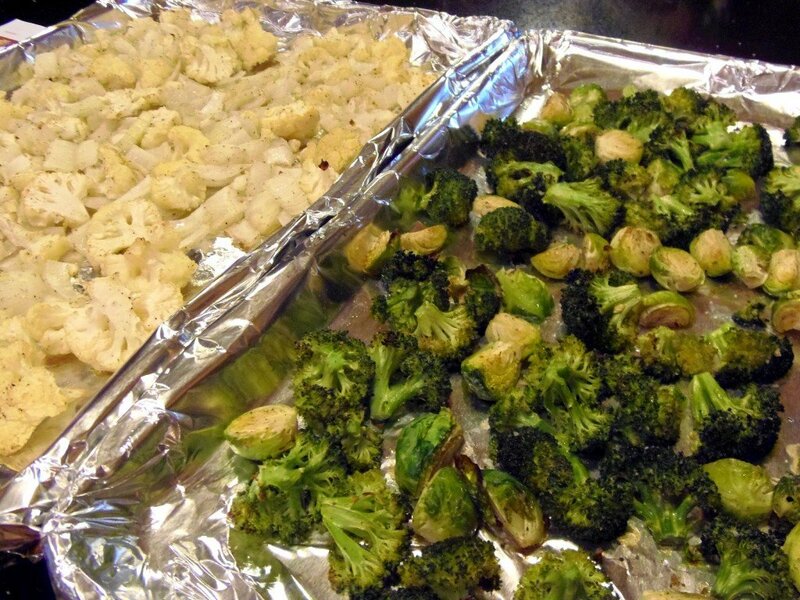 -Divide the vegetables between the two baking sheets and season each with salt and pepper. -Roast the vegetables in a preheated oven for 20-25 minutes, rotating the sheets halfway through the roasting process. Remove and cool slightly. -Working in two batches, place contents of one of the baking sheets of roasted vegetables into a blender along with 2 cups of chicken broth. Blend until smooth and creamed. Place the creamed vegetables into a large stock pot. Repeat the process with the second baking sheet of roasted vegetables and the remaining chicken broth. 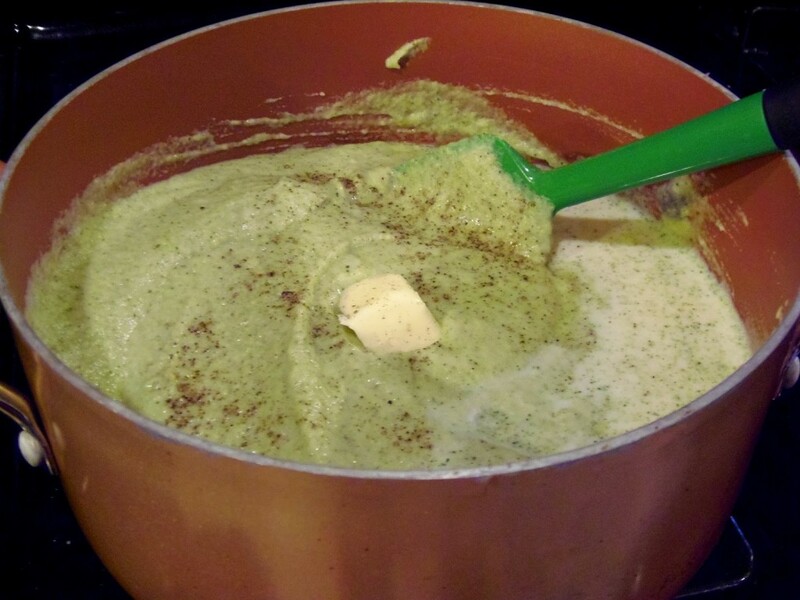 -Bring the creamed vegetables to a low simmer and season with additional salt and pepper if needed. -Continue to simmer for about 5 minutes and then stir in the nutmeg, butter, milk and the apple cider vinegar to finish and to brighten the flavors. -Garnish with cooked, peeled and deveined shrimp if desired. 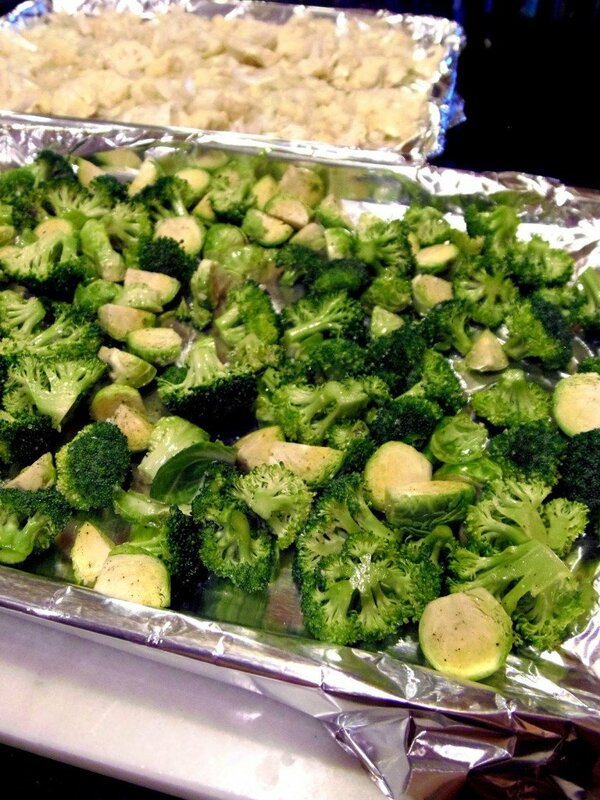 Spread the vegetables in a single layer onto foil lined baking sheets. I like to line my baking sheets with aluminum foil to make clean up easier. Roast the vegetables in a preheated oven for 20-25 minutes, rotating the baking sheets halfway through the roasting process. Blend the vegetables along with chicken broth until smooth. 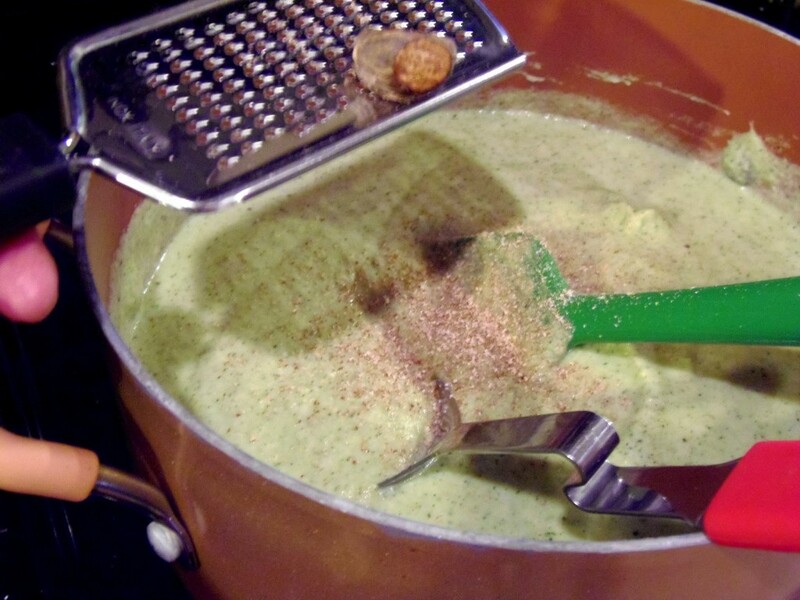 Transfer the creamed vegetables to a stock pot and season with nutmeg and additional salt and pepper if needed. Bring the soup to a low simmer and stir in the butter, milk and a splash of apple cider vinegar to brighten the flavors. *Note – don’t be afraid of the little bit of butter that is used in this recipe. It won’t add that many calories (since 2 tablespoons isn’t a lot for 8-10 cups of soup) and it will act as a flavor carrier and will allow the silky smooth flavor of this soup linger on your tongue. I really think you’re going to love the depth of flavor that the roasted vegetables provide in this thick and hearty soup. I made this a few weeks ago and am already anxious to make it again and portion it out into quick grab-and-go containers that will help me keep on top of my healthy eating and exercise plan. If you’re looking for more healthy and light recipes to start the new year off with, please check out the other recipe links below from the #SundaySupper family of cooks and bakers. When it comes to eating light and right in the new year, we’ve got your back. Thanks so much T.R. Crumbly of Gluten Free Crumbly for hosting this week’s event! Thanks so much visiting me in my Kudos Kitchen. I’ve enjoyed your company! Just yesterday I was thinking about how it's been too long since I've had vegetable soup and now I see this. I'm craving it already. Oh my – this soup looks so creamy and wonderful! Love the color! This is full of all of my favorite veggies, then you add shrimp? Oh yes, I need this!! I love all those veggies together in this soup! Any time I can have a CREAMED soup and not feel guilty, I'm all over it! What a beautiful recipe that's loaded with healthy goodness! WOW and yay–I just saved this, Renee! I just love love love how many veggies go into this wonderful soup. It reminds me of the broccoli soup I wanted to recreate from California Chicken Cafe. Thanks for sharing this, and have a wonderful new year! Love all the veggies in this! Love it! This is most certainly a soup I will eat all the time! No joke, I would slurp up that entire pot. YUM! Oh wow – roasting the vegetables must give this soup incredible flavor! Looks delicious! 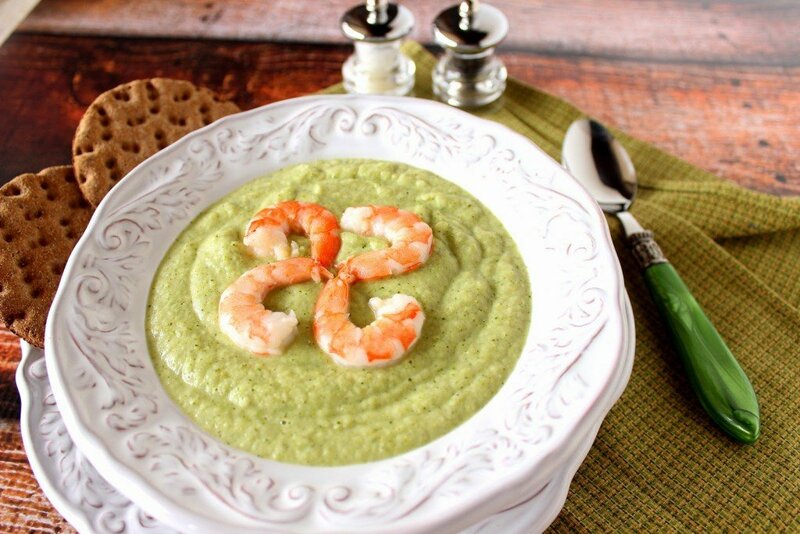 Love roasting veggies and this soup look so creamy! Roasted vegetables are great at any time, but in a soup is even better. What a wonderful, comforting dish, Renee! I am in LOVE with this soup. The roasted veggies are right up my alley and nothing beats a piping bowl of thick soup. The shrimp are just like the icing on the cake….minus a few calories! I am a big fan of shrimp so I will definitely be adding it to the top! 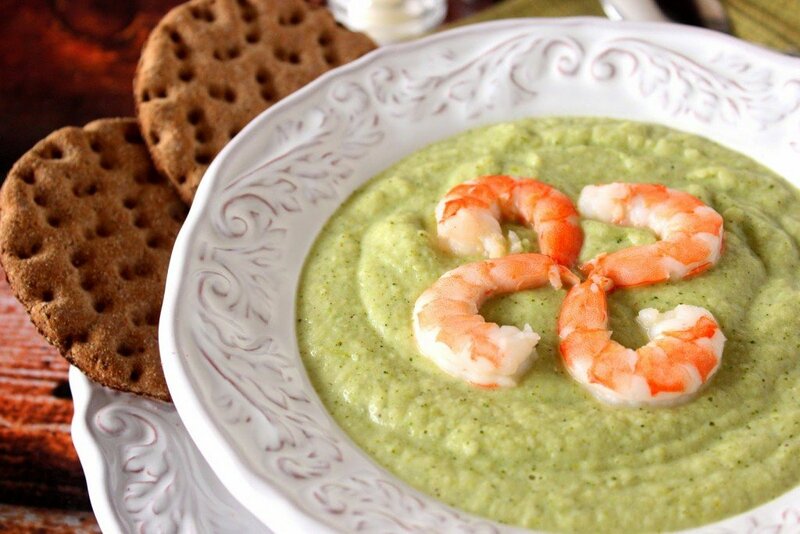 I think the colors of this soup and the shrimp look great too. I just can't get over the color of this soup. It's so vibrant and I bet the depth of flavor from roasting the vegetables first really comes out. 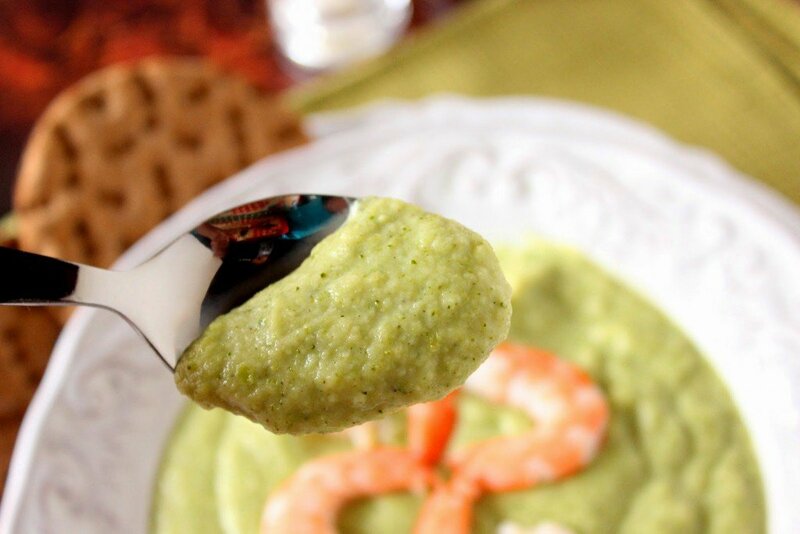 I'm not a huge fan of pureed vegetable soups – but I'm a sucker for roasted vegetables (especially broccoli), so I'd eat a bowl of this in a heartbeat! Renee, this looks delish! I love shrimp and I just bet those flavors are fantastic together! This looks so elegant! I bet roasting the vegetables gives this soup an amazing flavor. Nice! I am a veggie roasting machine straight through spring. It's my favorite way to eat veggies. I love that you roasted these veggies (my favorites, by the way) before blending them into this gorgeously thick soup! And I'd sooo add the shrimp on top. I've been craving soup like crazy lately, this is perfect timing. I have everything to make it right now too!